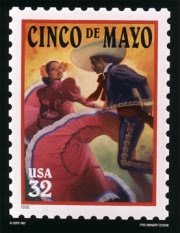 It's Cinco de Mayo! As a treat to all my ethnic readers, I will write the rest of my post in Spanish. Vamanos a la cocina para beber Coronas y preparar tostadas de gallo. Okay I'm totally out of energy for Monday morning Spanish. The 8 years of high school and college courses did not help me whatsoever. My 7 year old nephew can speak better than I can and he's only 1/2 Mexican. 1. Heat 1/4 inch of oil in small skillet. 2. Cook tortillas in hot oil one at a time for 20-40 seconds on each side or until crisp and golden brown. 3. Drain tortillas on a paper towel; keep warm in foil in 250° F oven until serving time. 4. Heat beans with a touch of oil. 5. To assemble, top each tostada with beans, lettuce, chicken, salsa, cheese, avocado and tomatoes. Serve with an icy Corona or better yet a bucket of Coronitas. Ay Yi Yi es una fiesta! My son is in his first year of Spanish in HS. I remember very little of mine... our conversations obviously take on an almost surreal tone, but are hilarious. Yum, yum - I'm thinking tacos or tostadas after our Little League game tonight will be in order. And, of course una cerveza! I remember very little spanish from when I lived in california and was required to take Spanish class. something about going to the store and buying beer??? the recipe sounds great, I must try it out! I took French in highschool. It is equally useless to me these days. I do know a little spanish though (better than Punkinhead's, even) because I love mexican food!